Rising dramatically above the spectacular Swiss landscape surrounding the well-known resort Flims – Laax – Falera, Jürg Conzett’s unique mountain trail contains seven bridges crossing a wild stream. An internationally renowned civil engineer, Conzett brought his considerable talent and experience to this project, and the results are groundbreaking and visually appealing. Each bridge uses a different type of construction and building method depending on the specific geographic features of its location. 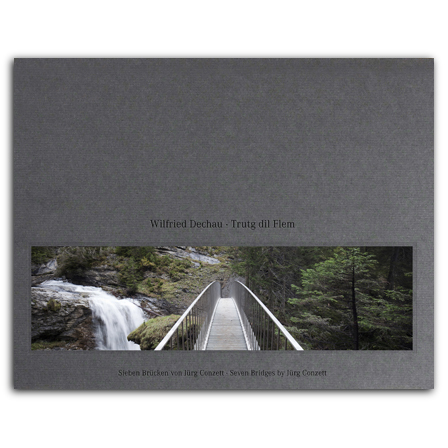 Wilfried Dechau has catalogued the project with over one hundred previously unpublished images of the bridges and their surrounding landscape. His atmospheric photographs provide readers with a beautiful and up-close look at both the striking architecture amid the beautiful wilderness. Also included in this book are sketches and plans by Conzett and a series of essays by Dechau, Conzett, Ursula Baus, Christian Dettwiler, and Christian Marquart. (born 1959 in Kaiserslautern). Studied art history in Saarbrücken and architecture in Stuttgart and Paris. Doctorate Stuttgart University. 1989–04: editor at db. 2004: co-founded frei04-publizistik. Since 2010 member of the Board of Trustees of IBA Basel 2020.
, Dipl.-Ing., DGPh (born 1944 in Lübeck). Editor and editor-in-chief (1980–04) of db. Author (incl. “architektur abbilden”). Founder of the architectural photography prize (1995), architekturbild e.v. (2003) and the gallery f75 (2010). Freelance photographer since 2004.